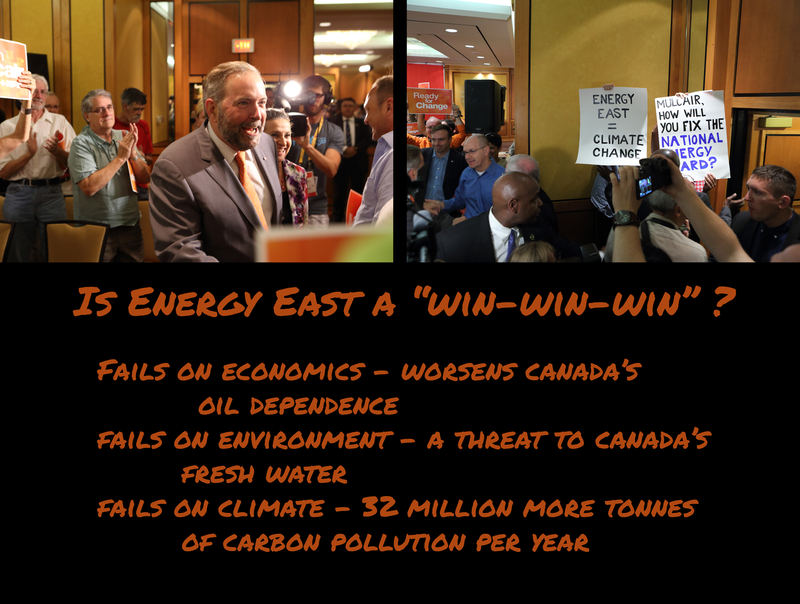 Last night, Thomas Mulcair told Canadian voters that the Energy East pipeline could be a “win, win, win” scenario. A win for the economy, a win for the environment, and a win for the climate. Today, Toronto350 activists attended an NDP rally to make sure that the Honourable Leader of the Opposition understands that we do not agree. Ex-Quebec Minister of the Environment, Mr. Mulcair said that the way forward was to fix the environmental assessment process and the National Energy Board. Our volunteers went to his rally in Toronto to ask a simple question – how? How would he undo the damage done to the integrity of the Energy Board? How would these improvements change the fact that building and running pipelines is inherently dangerous to the environment, increases our dependence on oil, and pumps even more carbon into our fragile atmosphere? How could the 35% increase in tar sands extraction Energy East would facilitate be compatible with climate action? Unfortunately, rather than engage our activists, the NDP had them removed from the rally. The NDP's position baffles more people than us. They oppose Northern Gateway, they oppose Keystone XL. Energy East faces all the same problems but is a far bigger pipeline. It would stop the NDP from fulfilling the Climate Change Accountability Act if elected. The Liberals are just as bad. Trudeau promised a "fixed" Energy Board would move resources to market. Trudeau promised to secure the oil industry Energy East. We join millions of other Canadians in again urging all political parties to reconsider their positions on pipelines, which are a lose, lose, lose scenario. Throwing out dissenters is not the Canadian way and not how we will solve the most pressing issue of our generation. Toronto, Ontario – This afternoon at 1:30pm, various climate action and First Nations groups including Toronto350.org gathered outside the Four Seasons Hotel holding anti-pipeline banners for Enbridge’s annual general meeting. There is a widespread assumption that divestment is a matter of sacrificing financial security in order to uphold an ethical position. In the case of fossil fuel corporations, this characterization is inaccurate. These have been underperforming investments, and the companies face major risks to their performance going forward. The source of the social injury described in chapter 2 of the brief – the massive reserves of coal, oil, and gas which these companies possess – are also the source of this financial risk. That risk arises, firstly, from the reality that governments are increasingly restricting the right to use the atmosphere as a dump for carbon pollution and, secondly, from the increasingly extreme character of fossil fuel energy development. As Shell's mishaps with arctic drilling and BP's destruction in the Gulf of Mexico demonstrate, fossil fuel corporations are seeking out ever-more-expensive and ever-more-dangerous ways of sustaining and enlarging their reserves. In 2012, the top 200 oil and gas companies spent $674 billion on exploration and development of new reserves – reserves which are at risk of becoming stranded assets in a carbon-constrained future. This letter was sent to the Honourable Glen Murray, Ontario's Minister of the Environment and Climate Change, on March 28, 2015. It is signed by Stuart Basden, President of Toronto350.org, on behalf of Toronto350.org's membership. The letter is in response to Ontario's Climate Change Discussion Paper, which invited feedback from all sectors and all Ontarians.